Could We Get An Oliver/Felicity/Black Siren Love Triangle In Arrow Season 6? Emily Bett Rickards and Katie Cassidy were asked about the possibility of an Oliver/Felicity/Black Siren love triangle in Arrow Season 6. 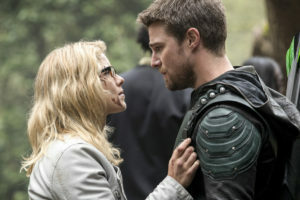 No one’s necessarily saying that there will be a love triangle between Oliver, Felicity, and the Black Siren in Arrow Season 6, but it seems the show’s leading ladies, at least, would be down with the idea. Answering a question at the Heroes & Villains Fan Fest in London (and reported on by ComicBook), Emily Bett Rickards and Katie Cassidy offered their thoughts on the subject. “That would be a really interesting dynamic,” Katie Cassidy added. “I don’t know why, maybe it’s because we’re so close, but it’s so fun playing my Black Siren against Felicity. I just think this whole other thing comes out of me,” Katie said. Arrow Season 6 premieres this Fall on The CW. Would you want to see a love triangle? Talk about the possibilities below or on our Arrow discussion forum!